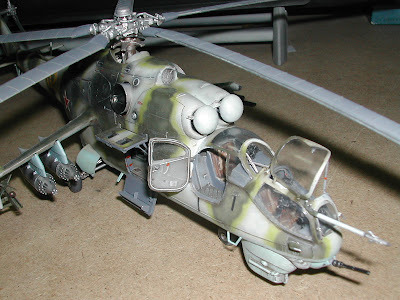 Here's the classic Monogram 'Hind' gunship in 1/48 scale. I know it's the only game in town, and I know it doesn't go together very well, and the decals are terrible. But 25 years on, isn't the kit still much the same? When we buy a kit from the famous Classic Airframe range, we might be buying something from our wish list, but there's a reason why they say 'experience essential' on the box. The detail offered is excellent, but it can be problematic getting it on the model. The decals have improved over time, but for £40 they should have done. Anyway, my ambling point is that 25 years of technological advances later there's no guarantee of a superior kit. Getting down from my soap box, my old kit has turned out ok. The build was not bad overall, although most things had to be coaxed and sanded into position. The end result looks good, I think. The worst fit problem was the canopy. This needs concentrated sanding to get even a reasonable fit. The plus points? What nice detail! 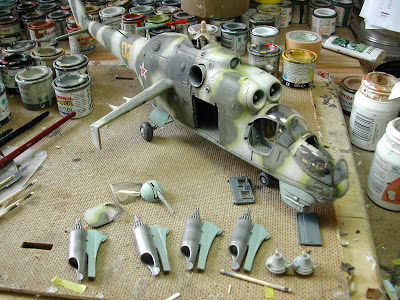 The main rotor head, the main gear bay and the surface detail all show lovely moulding, and all respond well to Alclad metal finish, subtle dry brushing or just a good paint job. 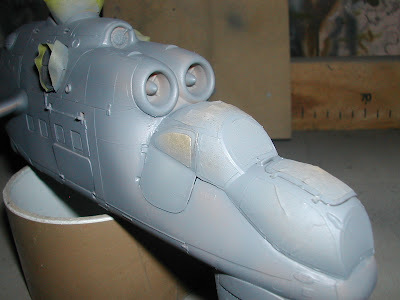 With the current renaissance of 1/48 subjects, the old 'Hind' gunship gets a new lease of life. It's a terrific battlefield airborne artillery piece. And an old fiddle?